The Union-Endicott Education Foundation was incorporated in March 2004 by members of the Endicott community as an independent, not-for-profit organization. Our mission is to support, enhance and promote quality educational programs for U-E students by providing funding for creative and enriching projects and experiences not provided by the regular school district budget. In May 2015 UEEF celebrated ten years of commitment to this mission. Our first initiative was to facilitate the establishment of a Pre-Medical/HealthCare Careers Pathway Project in partnership with United Health Services. This program gave U-E High School students the opportunity to explore and experience first-hand various medical and health care professions. In the fall of 2006, the UEEF received a grant from BAE Systems Platform Solutions to support a team of eleven U-E High School students participating in the FIRST Robotics nationwide competition. Using science and technology, students designed a robot that could perform in a highly structured “game” designed by a committee of academics, engineers and scientists. UEEF is proud to continue our support of the TigerTronics Team. 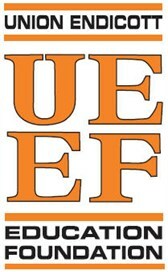 UEEF awarded the first of its Innovations Grants to U-E teachers in the fall of 2005. This annual program is at the heart of our mission, distributing funds for educational projects that provide innovative and creative educational opportunities throughout the K-12 student population. More than 100 grants have been awarded, benefiting students in every grade level and every building. A more detailed description of the Innovations Grant Projects for this year appears on this website. In 2010 UEEF offered a special round of funding for a Collaborative Grant. The submissions were excellent and it was decided to fund an elementary and a secondary project. The project at UEHS was “Step Into STEM” and it was funded for $10,000. Charles F. Johnson Elementary received $6000 for its Sensory Integration Project. To celebrate the Ten Year Anniversary, grants were awarded to each building in 2015 for a total of $7000. Special Request Grants are available to teachers whenever needed. Fundraising is essential to the success of UEEF. The Union-Endicott School community has been very generous through a payroll deduction option. UEEF Team Trivia Night has been a major success every year since January 2007. UEEF Raffle Baskets at the district’s Fall Craft Fair are always very profitable. An Annual Appeal, the Binghamton Senators Raffle and a spring fund-raiser also contribute to our finances. UEEF is extremely thankful for the support we have received from our schools, community, and alumni but we can only continue to fulfill our mission with your help. Please look through the information included on this website and consider making a tax-deductible donation to enrich the lives and learning experiences of our children.